Cooperative heist aficionados have been waiting for Monaco: What's Your is Mine for quite a long time. I think it has been in development since 1986. I may be wrong. I played Monaco for the first time at PAX Prime last year. It's one of those games you see on the show floor and you instantly think, "I want to play THAT." And then you want to play it again. If you don't know much about the game I suggest you check out a few gameplay videos starring the Co-Optimus staff. WARNING: I wasn't able to participate, due to some sort of Souls bender at the time, so the videos are sorely lacking in the swearing department. (Truthfully, I wasn't invited, and I'm still bitter about it.) This game is ridiculously fun with a few friends. It can be yours on either XBLA or PC on April 24th. 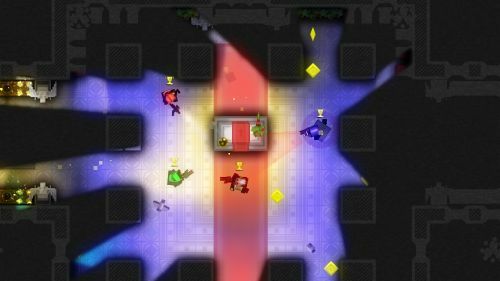 Monaco: What's Yours is Mine supports four player local co-op and four player online co-op. It's priced at $15 or 1200 MSP. Indie Devs Co-Op Their PAX Booth, Give out "Diamonds"